2018 proved to be one of the most successful years to date for Clonmel Boxing Club with Ellie Mai Gartland’s European gold medal win in Russia being the highlight amongst many great successes in the ring during the year. 5 national titles were won by Clonmel Boxers during the year with 2 boxers finishing as runners up after being beaten in their respective Irish finals. The club also won the best club trophy at the Waterford / Tipperary county championships for the most titles won. Dean Gardiner got 2018 off to a great start with him claiming his 3rd senior elite title at superheavy weight and having the honour of being Irish elite team captain for the year, Dean represented Ireland in the European union championship in Spain. Conor O Donovan won his first Irish title in some style with taking the junior cadet title at 44.5 kg and in the process booking a place on the Irish team that competed in the European cadet championship in Albena, Bulgaria. It was Conor’s first time representing his country which didn’t phase him, winning his bout in the prelims only to exit the championship in the quarter final stage on a split decision to his Czech opponent after a great performance. Conor took home the best boxer award at the Wexford Box Cup out of 387 boxers and the box cup title which marks him out as one to watch in the future. Courtney Joyce claimed her 2nd successive Irish title with some stand out displays of controlled boxing which defies her young age. Ellie Mai Gartland had an outstanding year even by her standards, first winning the girls under 15 Irish title and going on to claim the senior cadet title and a place on the Irish team to compete at the European junior championship in Anapa, Russia. It’s here were Ellie made history, becoming Clonmel Boxing Club and Tipperary’s first European boxing champion, claiming gold in the 54kg division. Ellie Mai finished the year with a 19 contest unbeaten in all competitions record. Ellie Mai and her twin brother Jerome also made history when they both represented Ireland on the international against England in Edenderry, Co. Offaly. Ellie beat her English opponent on a unanimous decision with Jerome taking victory over the English champion on a split decision. Jerome Lonergan/Gartland also had a successful year, winning an excellent Munster title and progressing to an Irish final only to be beaten on a split decision. Leah O’Gorman was also unlucky in an Irish final after putting up a great display in her first year of boxing. Raymond Joyce was another boxer who made great strides in 2018 and in one of the most memorable performances of the year, Raymond was beaten on a split decision in the final of the Wexford Box Cup by European cadet champion, Michael Faulkner from Cork, pushing the gold medal winner all the way. 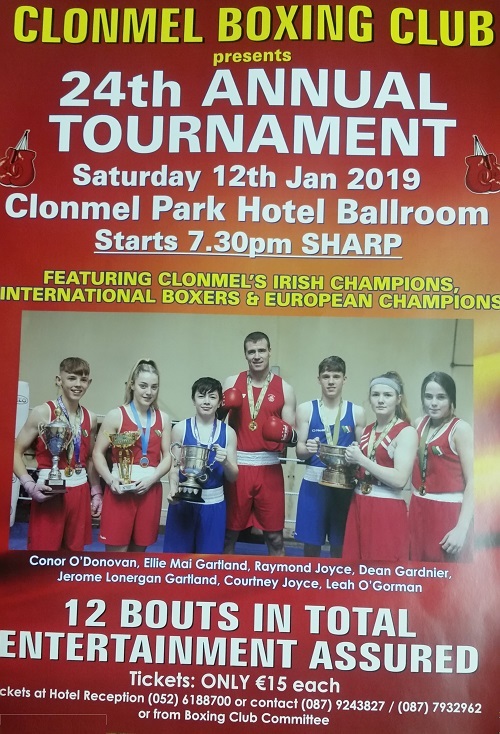 Clonmel Boxing Club has a busy year ahead of them with Dean Gardiner preparing to defend his senior elite title in February and the county championships in the same month, but before this Clonmel Boxing Club will host it’s 24th annual tournament in the Clonmel Park Hotel ballroom on the 12th January 2019. It promises to be an action packed night of boxing featuring Clonmel’s Irish champions, international boxers and European champion. Their are 12 bouts in total which starts at 7.30 pm and a great nights entertainment is assured. Tickets are only 15 euro each and are available from committee members.